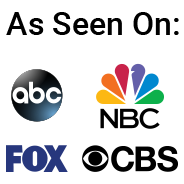 The grill light reviews we did will shed some light on the best BBQ outdoor grill lights we could find and since this is the future, we focused on led and waterproof grill lights in these reviews. We use a lot of gadgets for our grills but this is one I highly recommend of adding to your arsenal. The amount of light they give. Like always we try to find the top rated products and that is what we do with the grill light also. We have tried to find the top rated and best BBQ lights for you with the highest selling numbers and highest rated numbers. Some are a clip on type and others are made for for handle mount. A flexible light is also an option we looked at. “I had one of these on my beloved Genesis Silver B. When I gave the grill a new home to upgrade to a Genesis S-320, I ordered this the same day. Fits snug on the handle and although some people mentioned it turns not of when you shut the lid and the light flickered we found the answers to those Weber grill light not working problems. The battery compartment of most of the Weber grill out handle light come with a lid that had to be turned to lock it. If you do not lock it right the batteries don’t make a good contact and the light will flicker or not come on at all. The Weber grill handle light should not turn off when you close the lid. It is suppose to dim and sty on so you can find the lid handle easier in the dark. There are however people who mentioned that the Weber grill light wont turn of and I have not found a good explanation yet. Just remember that this Weber genesis grill light can be used on other grills than a Weber, but it must have a round handle on your grill. The high rating justifies that some people call this the best grill light for Weber Genesis grill. When I read about a product and from the over 540 ratings more than 450 give it 3,4 and 5 star rating I think we can say that this is pretty good product. A grill light Weber is what people look for online and I hop they find this page. One owner called this the best Weber genesis grill light. This is also called Zeust Sirius 2.0 barbecue grill light. It comes with 10 bright LED lights and the adjustable, made of zinc alloy, clamp makes it easy to install on your grill handle round, oval or square with no problem as long as the diameter is not more than 1.45 inch. “I live in an area where grilling is possible almost year-round. The only trouble is I have had trouble seeing what I’m doing when darkness falls before time to cook dinner. This light is SO bright! It actually has two settings, but even the less-bright one is a big help to see the color of the meat I’m grilling. Although I was not able to find a lot of reviews the ones I found were all 4 and 5 stars. One of the most mentioned positive things and in my opinion most important thing is that this grill light is very bright and provides a lot of light. The clamp was also one of the things mentioned as very easy to use and pretty sturdy. The 3 included AA batteries seem to hold on for about 18 hours and with the option that turns of the light automatically you can even use it up to 50 hours I read. I rated this Zeus grill light with a 4.8 stars but was actually thinking about giving it a 4.9 star rating. Reason I did not do that is the fact that I could not find a lot of information to justify that. The Fulcrum 20019-301 6 LED with multiflex and clip on light gives the same amount of light as a 60 Watt bulb with the 6 leds. Unfortunately the 3 AAA batteries are not included in the package and have to be bought separate. Warning:This light is not water proof. The fulcrum lights are not only good for a grill or barbecue but also can be used inside or on a workbench. The part you have to watch is that it is not water proof so can not be used outside on the grill when it rains. It got some great ratings when it comes to the amount of light it gives. It really seems that it gives just as much light as a 60 Watts light bulb. The clamp works good on a horizontal surface but tends to slide a little when you clamp it on a vertical surface. One user advised to use a piece of cloth between it to improve the grip. The adjustable metal neck makes it very easy to use. If you have a side table on your grill this it the best place to attach it in my opinion. A 4.2 star rating overall is in my opinion the right rating since this is a light you can use in many places. Not being waterproof is however not to good for a grill light. The brand name is Kuisiware and to be honest I had never heard about it. It is a number one seller on Amazon in the commercial street and are lightning category. “This light appears to be quite handy -not only for its intended use but for use anywhere you need a light and need two hands to accomplish a task -(for example, to work under the hood of my car). The clamp is lined with rubber so not to mar the finish of whatever it is fastened to and provides a no-slip grip. The switch was a pleasant surprise. It is a touch sensitive switch -just tap it lightly with your finger and it operates on/off. The design looks like some thought went into it. One nice thing that the designer included as an extra, in my view, is the little ribbon used to pull the batteries out -a nice touch. Overall it is a nice design and not just the bare minimum that one might see on a cheaper model of some sort. With an average of 4.8 stars it was hard to find some cons of this grill light, but we found some. One reviewer mentioned it did not work and had to send it back. not to bad 1 out of 150. Another one found out you can get it not too hot. The lens will start to melt. good tip, but still not a negative point since I think most grill light will melt when they get too hot. Third point was that it is not waterproof and have to be taken of or keep covered. The manufacturer answered this question and stated that it is better to keep and store it in a dry place, but it should withstand a little rain. Although they have tested it under a shower for 5 minutes and it kept working. Overall I think we can recommend this grill light as one of the best buys. The customer service seems to be great and support their product with fast responses. The touch on/off button was according to many people a big plus compared to a push button. Water resistant but not weather proof is what we read for the grilluminator grill light, so take it off if you get some bad weather, but in most situations you can leave it on. Comes with 10 led light and a fit easy clamp mount. Very adjustable top light up the entire grill. With a rating of 4.7 there can not be too much wrong with this bbq light and to be honest we could only find complaints about it not being waterproof and the clamp got some mentions for not being to strong. The amount of light is good and there were some people mentioning that the on-off switch was a little to sensitive. With over 140 reviews and a 4.7 this can be called a good product but just keep it out of the rain. The Man Law comes with 12 led lights and and adjustable screw clamp. 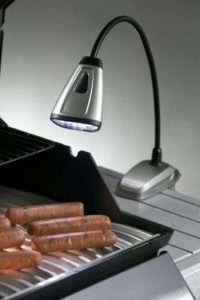 The arm of this flexible BBQ light can be extended to 23 inches. This is the first light that claims to be weather resistance and totally waterproof and can stay out in the rain. The aluminum gives it an extra protection against all weather. This is the only light in our reviews that is really weatherproof and we found out that many people state that this is true. There are also a few that mentioned water runs down the neck into the battery compartment so we have to take this with a grain of salt. Sealing the bottom with some silicone did the job to one person. 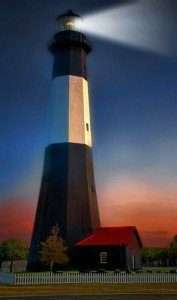 the lower ratings claim that there is not enough light coming from it. Send it back is always our advise. There is no 100% product. There are always the occasional lemon. Overall this seems to be a pretty good light although we seen a few comments that the light is to concentrated in a small area and not spread to much. The clamp in combination with the magnet works great on a metal surface, but just the clamp seem to be a little weak. Overall this grill light is in our top 5 for a good reason although it only received a 4.2 rating because it is not weather resistance like claimed. I found this Fulcrum 20019-301 LED Grill light and was impressed with the amount of reviews I found and decided to take a little bit better look at it. What I like is that it is LED and this will safe in the battery use and most of the time the amount of light is very well. The flexible neck is about 19.5 inches long and this is long enough to light you grill area and the light beam seems to be very wide and illuminate the whole grill. Although weather proof and okay for outside use it is not a water proof grill lightand not meant to stay out in the rain. This lamp can also be used as a light for a workbench or inside as a hobby light or even reading light. After reading a ton of the customer reviews I think we can recommend this grill light as a good buy. When I started these reviews of barbecue outdoor grill lights I found that there is no such thing as the best grill light for every situation. 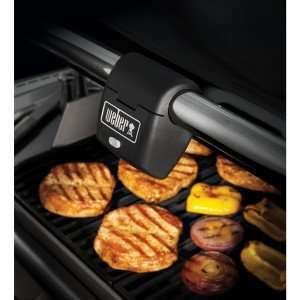 Some of the grills are better equipped for a clip on grill light on the handle and some are better to be sued with a fixed handle mount type. I read about people who love their Flexible light and others will never use anything else than a cordless. Magnetic grill light are also an option. It is just case to find the one that fits your situation and grill the best. That is why I did not call this the best grill light reviews although I think I succeeded in finding some great grill lights that people like most. Although some of the best outdoor BBQ lights have models that are waterproof I still think it is best to keep them out of the rain to extend their life. The BBQ light fixtures need to be pretty sturdy and that is why the gas grill lights with LED lights versions are recommended over other ones. We might add more outdoor grill light reviews here when we find more high rated ones. Overall a gas grill with led lights can help you grill more hours. if you have any BBQ lights you like to recommend let us know in the comments below. Most of the grill lights are made in a way that they will fit most outdoor grill we reviewed and also a great deal of the charcoal and portable propane gas grills we reviewed. Make sure to check the measurements of the handle before you order one.